Technically, it's now December. To me, it's still November 30th. So I can still do a post about November obsessions, right? Whatevs. My blog, my rules. So I'm gonna do it anyways. I would have had this post done a lot sooner, if my keyboard to my iMac was working properly. Or should I say, if it worked at all. Then the laptop decide that it wanted to do something quirky too. Luckily, it stopped being an electrical jerk and started working again. I had taken all these photos to go with this post, but the laptop doesn't have the software I use for my camera and I couldn't be bothered to try to find the CDs and add the software to the laptop. Ugh. Story of the week. Seriously. All week everything and anything that could go wrong or bad, happened. Such as the computer problems mentioned above. My iPhone is starting to glitch (it was never the same after it took a dive into the Munchkin's bath sometime last year), but it's a super old iPhone (in Apple terms, that's 3G old). Brett bought a new TV 2 weeks and with that we finally gave in and got a digital cable box (I was against it, mind you I don't watch that much TV so felt like there was no need to have the box). Well, let's just say that we've been having issues with this stupid box on a daily basis and we've made a few trips to the cable company and been on the phone with their tech support. Several times. I really want to smash that box Office Space printer style. Something's wrong with the washing machine's agitation cycle, and the dryer is making weird noises. The coffee grinder is dying (we won't even talk about what would happen if I couldn't have my morning coffee! ), the espresso machine needs to be de-scaled, my tea infuser somehow fell apart, and the oven is burning everything. Everything. To top it all off, the Munchkin has decided one night that he doesn't want to take a bath. Ever. Or wash his hands. Or wear half of the clothes in his closet. Or wear sock. Let's not go near the shoes issue. I swear, his tantrums have gotten worse. Volume wise. I'll admit that ever since he turned three years old he doesn't have tantrums as often, but when he does throw one it sounds like bloody murder! Did I mention that he has also become increasingly stubborn since turning three? Oh yeah. His way or the highway stubborn. Some days I'll be lucky if I can get him to leave the house within an hour after the planned time of leaving the house. I thought once the "Terrible Twos" were over, it was suppose to get better?? I'm surprised that my hair hasn't gone completely grey. With the major lack of sleep that I've been dealing with these past few weeks and the overwhelming decline of knitting time (not to mention my extreme online absence...so sorry to those who have emailed/messaged me and have yet to hear a response...I'm alive, just rarely online), I'm amazed as to how well I've been handling all of these...inconveniences. Let's just hope December goes more smoothly. In the meantime, here's November's obsessed list. I had to dip into the interwebs and borrow a few photos. I've linked to where I got them from, but if I missed one and the owner just happens to stumble upon their unlinked photo, please note that I tried to give credit where credit is due and I'm sorry if I missed crediting you on your photo. I've currently run out of luck. Please let me know nicely and don't send me hate mail! Thank you. 1. SweetGeorgia Yarns. 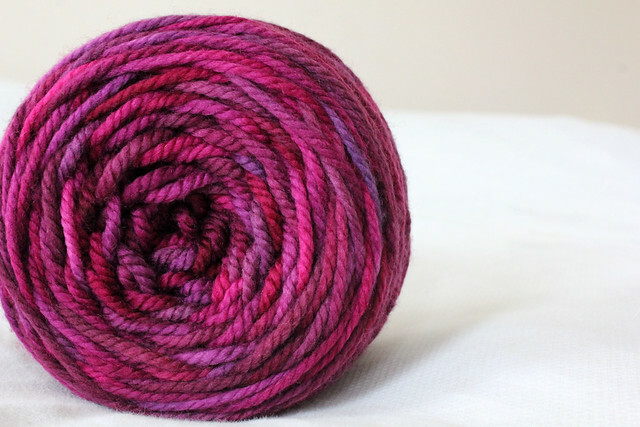 Do I really need to say why I love SweetGeorgia Yarns so much? I'm such a sucker for colour, especially bold and vibrant colours - points that SGY is so well known for. It's no wonder why I mesh so well with SGY! This month I've started and finished two projects with SGY and am still plugging away on a cardigan I'm knitting for the SGY Winter KAL. Just when the thought of knitting up my SGY stash, a box full of SGY arrived at my door last week. Felicia really stuffed the box so full of yarn that it was practically bursting at the seams!! I can definitely see a ton more cardigans knit out of SGY in the future! 2. Jane Richmond patterns. This month alone I've cast on the Oatmeal Pullover, a Shannon, and I just finished winding yarn for a Rae. What do they all have in common? That's right, you're so smart. They're all designed by the talented and lovely Jane Richmond. The Rae though, is to be a Christmas present...but to tell you the truth, I think I just might keep it for myself. Shhh! Don't tell anyone! I had also plan on casting on an Audrey hopefully in the week or two. I promised myself that I wouldn't cast on until I got caught up in my sewing...and once I at least swatched for Brett's sweater...and once I decide on a colour...but then earlier today Jane just had to go and release another pattern that went straight into my queue and is begging to be knit up pronto. I swear, we share the same knitting brain! Ever since the weather turned chilly here I've been thinking and wanting to knit nothing but comfy pullovers to snuggle up in to stave off the freezing cold. Jane must have heard my knitterly cries and produced exactly what I was looking for! Yes, the Classic Raglan Pullover must be knit. Now. 3. Winter Woollies. I'm being a complete and total wuss. I swear it was colder this time last year and I was fine. This year, I'm a freakin' pansy and can't seem to get warm. Anything that guarantees to be warm and a quick knit, I'm all for. I just.want.to.be.warm. And it's been forecasted that it'll just get colder. Great. According to one weather network it's going to be the coldest it has ever been in 20 years!! Fantastic. Just freakin' fantastic. Can't you just hear the sarcasm dripping off that last sentence? 4. Signature Needle Arts. 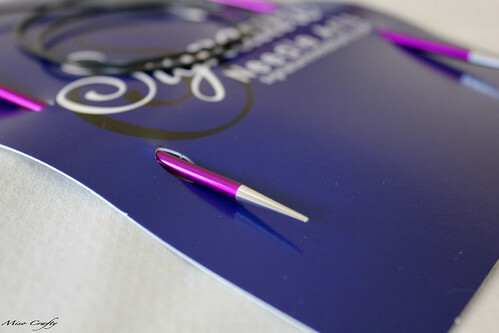 I've been impatiently awaiting the arrival of some new needles...by, you guessed it, Signature Needle Arts! When the opportunity of getting my hands on some more of these fabulous needles arised, you better believe that I took it. The first pair (which I got in the summer and have been using non-stop ever since) I got in a size that I used the most - a 3.5mm (US 4). The first time I used the needles I knew I was going to be hooked and that I was going to want more of them. They are simply amazing and worth every penny...but a goal that I was going to have to save up for and would probably take me quite a while to accomplish. While I don't have a complete set, I do have a few more to add to my "collection" (and by collection, I mean my solo circ). I'm one happy knitter! One that is dying to cast on a project using each and every single needle!! I'm seriously drooling over them and so want them to be mine. Obviously I would replace the red laces with pink ones. 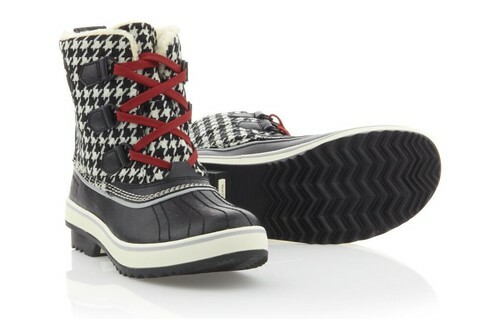 I've been lusting after these babies since last winter, but didn't think our mild winters warranted such a warm boot. Yes, I'm a fool. I'm still kicking myself hard for not purchasing them on sale when I had a chance earlier this spring. Funny how growing up in the Kootenays I used to hate Sorels and thought they were the ugliest things known to man, but now that even uglier boots have come on the market Sorels have definitely dropped out of the race. A few years ago I had even told Brett that I wanted to track down a pair of old school white Sorels and make it my mission to make them en vogue. While I have seen them in a few stores, sadly I can't find a pair small enough to fit my feet. Even more sad is that the company doesn't make this white boot available in kids' sizes. But oh, if they did...I'd be running to the cash register with credit card in hand! 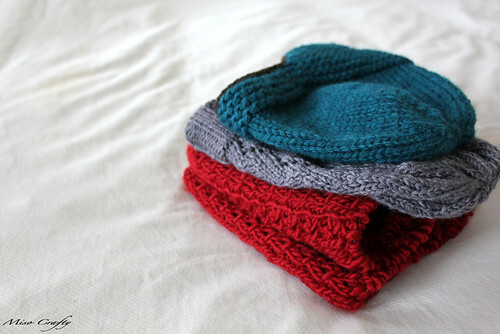 I'm sending out good vibes that not all my electronics will have to be replaced and that I can somehow obtain a pair of warm winter boots...and the time to knit. C'mon December, let this month be a good one! PS: I don't know if it's just me, but my PC laptop is editing this post funny. What's up with the different font?? This isn't Arial! I want my Mac back! That's so funny, last night before going to bed I was thinking of maybe knitting my little guy the smaller version for Christmas! I too am very jealous of this box of SGY... I bet it felt like Christmas opening that box! Did you get light headed! why, oh why did you have to show me that chunky SGY????? I am pouting as we speak because I'm trying not to buy yarn, but I have a real lack of chunky yarn in my stash (aka NONE). BTW, there were many a MisoCrafty made stash bag at knit night on Tuesday - we were representing! We had a conversation about how much we love them! I'm so sorry! But you have the willpower of a bull! I'm so proud of you for not buying any yarn. I'm putting myself on a yarn diet starting January. I think I'm going to have to put up a sign that says "What Would Natalie Do?" so that I can look at it whenever I feel weak from wool fumes!